'The perfect ingredients for a cracking good read. well recommended' Jean Fullerton. 'I've enjoyed all the books in this series' Cheryl. 'I love the way Fenella creates an escape from the real world for me every single time when I read her books' KMW. 'I would highly recommend this book' Mrs S Hall. Previously published as Blue Skies and Tiger Moths. The Spitfire Girl by Fenella J. Miller sweeps readers back in time to July of 1939. Ellie Simpson has been flying since she was fourteen years old and now works as an instructor at Glebe Farm Aero Club for Joe Cross. He taught Ellie as well as her two brothers, George and Neil to fly. Ellie meets Joe’s nephew, Jack when his plane becomes lost over the ocean one evening and she must help guide him back in. Jack Reynolds has been working as a stunt pilot in America, but he has returned to England to join the RAF. The pair get off to a rocky start, but they must find a way to work together when circumstances force Jack to run the school. With war imminent, the RAF needs men trained as pilots. Jack and Ellie must whip the recruits into shape as quickly as possible. When England declares war against Germany, Ellie decides to support the war by joining the Women’s Auxiliary Air Force. She is given a top secret assignment that will aid England is fighting the Germans. Swoop back to 1939 to join in the high flying adventures in The Spitfire Girl. 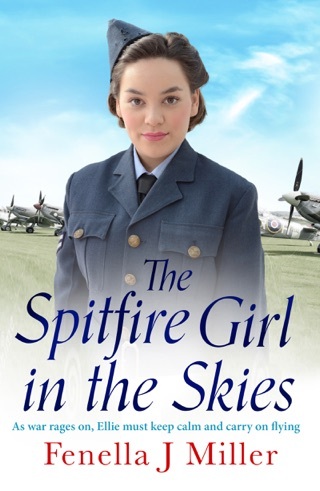 The Spitfire Girl gives us a tomboy for a main character with Ellie Simpson. Ellie has no desire to find a husband and settle down like other women. She is a spunky woman who loves to fly. Unfortunately, at the beginning of the war, there are no jobs available for female flyers. She joins the WAAF (Women’s Auxiliary Air Force) which, ironically, does not allow females to fly. Ellie has a caring father who in an unhappy marriage. Ellie’s mother married beneath her and her family cut her off. There is family drama, dashing soldiers, a mystery, romance and changing climate as war looms on the horizon (and then breaks out as Hitler’s soldiers march across Europe). I thought The Spitfire Girl was nicely written with steady pacing. Fenella J. Miller captures the feelings of the people towards the war. Everyone wants to “do their bit” to help defeat this horrible foe. There are historical references to the events that transpire during 1939 which set the stage along with the slang, books, cars, and clothing. 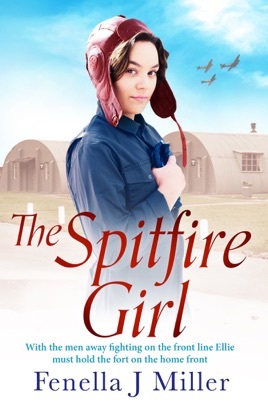 The Spitfire Girl is a unique wartime saga that will engage your mind and capture your heart. The Spitfire Girl is just the first book in the series, and we must wait until 2019 to learn what happens next.